A 5th wheel RVers dream – an auto slider that fits your short bed trucks industry standard rails! The 16K PullRite SuperGlide is strong enough to pull your 5th wheel at an affordable price. WARNING: This product can expose you to chemicals, which is known to the State of California to cause cancer. For more information, go to www.P65Warnings.ca.gov. Do you have to get in and out of your truck to activate the slider on your old hitch? 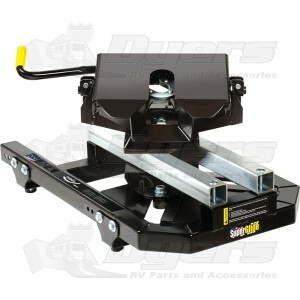 Or are you looking to get your first 5th wheel for your short bed truck and want an auto slider hitch? Times have changed and PullRite has changed with them – Dyers is proud to offer the PullRite 16k Industry Standard SuperGlide 5th Wheel Hitch that has way tubes and a cam mechanism that automatically slides as you drive! The PullRite 16k Industry Standard SuperGlide 5th Wheel Hitch will keep your trailer away from your truck windows as you turn. When you round a corner the Industry Standard hitch slides and moves immediately gliding over the way tubes giving space between your truck and the camper. The PullRite Industry Standard 16k hitch was made for RVers who have rail kits from the “other guys”, brands other than PullRite, in the bed of your truck. You can drop in the new hitch and be on your way to the campground! The PullRite Industry Standard 16k SuperGlide is rated at 16,000 pounds - you can pull your RV with confidence when you load up the Industry Standard 16k SuperGlide 5th wheel hitch! Proudly Made in the USA. PullRite offers a (5) year on their American made hitches. Dyers Tip – You will need to purchase a capture plate for your kingpin – The capture plate activates the sliding cam on your 5th wheel SuperGlide (capture plate sold separately). For fitment have your Kingpin manufacturer and Kingpin measurements and call PullRite at 1-800-443-2307. Low profile foot kit is already mounted on this hitch from the factory. There is no way to further lower this model. *Requires existing or new mounting kit & capture plate for new installations. Hitch head sits at a height of 17.25" tall before the rails are added. If hitch head height needs to be taller you need part number 2708 which is the tall foot kit, which makes the hitch head height 18.75". If you need the taller part 2708 please call to order. Like everything else, once you've figured out what works best with this unit it works great. Straight on latch with full weight on hitch to lock. Real good product so far. I wil use it next month on a 3 week trip. Don't know for sure till I use it a while. It is very hard to hook up to this hitch if you are not straight or level very hard to hook up and to unhook, I am taking it off and putting on another one this hitch is over priced. Handled very well pulling trailer. The 10 degree requirement to hookup was a bit of a problem on loop pull thru. Great product at the absolutely best price. Unless you have the windows down and know exactly what to listen for, you will never actually hear the hitch working.